Calbayog, officially the City of Calbayog (Waray: Syudad san Calbayog; Cebuano: Dakbayan sa Calbayog; Filipino: Lungsod ng Calbayog) and often referred to as Calbayog City, is a 1st class city in the province of Samar, Philippines. According to the 2015 census, it has a population of 183,851 people as of August 1, 2015. It lies along the coastal region of the province stretching about 60 miles (97 km) from the northern tip of the island and 180 miles (290 km) from southern boundaries. It is the third largest city in terms of land and water areas in the Philippines. The first crowned city of Samar and the nineteenth city of the Philippines. In 2010, Calbayog has 35,126 households with a population of 172,778 people, making up 23.6% of the total population of the province of Samar. Calbayog is one of the commercial trade centers in Eastern Visayas. Calbayog is subdivided into three major districts: Calbayog, Tinambacan and Oquendo. Calbayog's early history has been associated with the introduction and spread of Catholicism in the country. Calbayog started as one of the small settlements in the Island of Samar, an area assigned to the Jesuit missionaries. Jesuit chroniclers, as early as the 17th century, notably Fr. Ignacio Alcina, wrote many accounts about it and its people. Jesuit records and reports referred to the settlement initially as Ibatan and Jibatang (Hibatang). In the annual report of 1739 the name Calbayog appeared for the first time. Fr. de Huerta, a 19th-century Franciscan writer, noted in his work Estado Geografico that in earlier times, Calbayog was called Tiayban for having been founded near a river of the same name. Then it was transferred due to a flood to the shore of the Hibatang River, whose name it took. Then again the settlers transferred to the place that they permanently occupied and took the name Calbayog. Hibatang had already been a small settlement at the beginning of the 17th century. It slowly occupied a prominent place among the several small settlements. It became a visita (a large barrio with a chapel, similar to a chapelry in Britain) of Capul under the jurisdiction of the Parish priest of that town. The church of Calbayog were built from a scree formation near Malajog, shortest distance is now the Malabungto bridge. After the expulsion of the Jesuit missionaries from the Philippines in the 18th century, the administration of the parishes in Samar was handed over to the Franciscan friars. Calbayog as a town and parish during the Spanish period was composed of several villages, the most populated of which are called visitas. Calbayog grew from visita size and became a pueblo (town). It was created a separate parish in 1785. Separated from the ecclesiastical jurisdiction of the parish priest of Capul, it was later given its own minister, becoming a religious center. Its parish priests cared for the spiritual needs of the people living in what are now Calbayog City, the municipalities of Sta. Margarita, Sto. Niño and Almagro. By the late 19th century a number of visitas became the poblaciones when new towns were created from Calbayog. They were Caybago (later called Oquendo), Sta. Margarita, Weyler (later called Tinambacan) and Sto. Niño. In 1878, Calbayog was hit by a cholera epidemic, killing almost one half of the total population. Fr. Sebastian Cordova was forced to leave to save himself from the disease, bringing Biktoy with him as his sacristan. 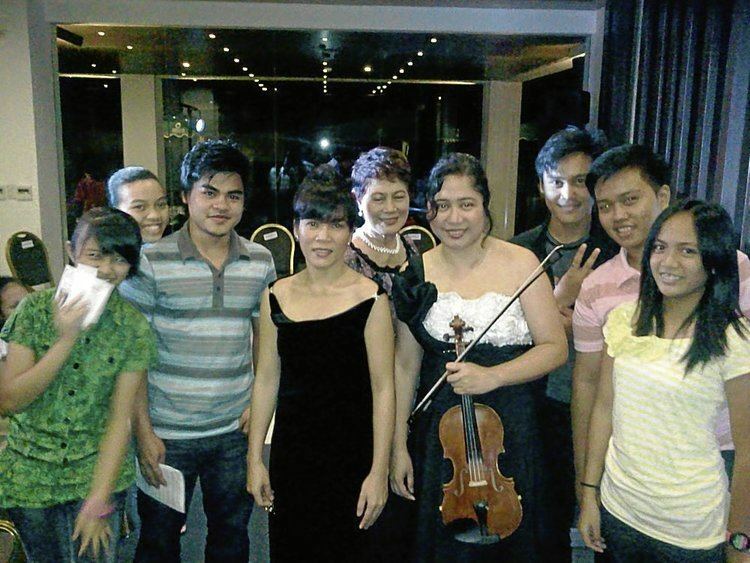 In Manila, Biktoy was a working student, serving the convent without sacrificing his studies. One year after his graduation, Fr. Cordova recommended Biktoy work for the Spanish Army. He was trained and accepted as a corporal. After a year, he was promoted and commissioned to become the second lieutenant in the infantry battalion of the Spanish Army. His first deployment and jurisdiction as an officer was in the whole Visayan Region. After the exile of Rizal in Dapitan, the Katipunan was born in Binondo, Manila. Andres Bonifacio and his men moved heaven and earth to fight against the Spanish government then led by Gob. Heneral Polavieja. The katipunan expanded its membership from Luzon down to the Visayas Region, thereby increasing the number of Katipuneros in a span of one year. Sensing the secret plan of the Katipunan to overthrow the government, the Spanish authorities raided a Binondo printing press where subversive documents were found and confiscated. One of the documents seized was the list of members of the Katipunan. The name Benedicto Nijaga was one in the list, being the collector of revolutionary funds in the area. Upon learning of the arrests, Governor Polavieja ordered the arrest of all suspected members of the Katipunan. Nijaga was arrested together with twelve other katipuneros while campaigning for revolutionary funds. Shortly after they were jailed and reportedly tortured, a trial ensued, reminiscent of that of Rizal and other Filipino nationalists. The 13 men were convicted and sentenced to death. On January 11, 1897, the thirteen were taken to Bagumbayan field under heavy guard. Just before sunrise, the men were executed. Colegio-Seminario de San Vicente de Paul (now Christ the King College and St. Vincent de Paul Seminary) was established in 1905 and La Milagrosa Academy was established in 1910. On April 10, 1910, the Roman Catholic Diocese of Calbayog was created by virtue of the Papal Bull of Pope Pius X, comprising the islands of Samar and Leyte. Calbayog became the episcopal see of the diocese. In 1942, the Japanese Army occupied Calbayog city. In 1945 the city was finally liberated by the Philippine Commonwealth troops and the guerrillas who had continued the fight against the Japanese throughout World War II. It was only much later that other dioceses in the region were created. Republic Act No. 328, otherwise known as the City charter of Calbayog was signed into law on July 15, 1948 by then President Elpidio Quirino. The first set of city officials, incumbent municipal officials of the place, were sworn in on October 16, 1948. The city comprises the territorial jurisdiction of the former Municipalities of Calbayog, Oquendo and Tinambacan. In January 2008 Roberto Navidad, a Regional Trial Court (RTC) judge was shot dead in Calbayog City outside a drugstore at the corner of Gomez Street and Nijaga Boulevard. As of 2008, the crime was unsolved. He was the 15th judge to be ambushed in the Philippines since July 20, 1999 (the 14th under the Arroyo government). The city has a total land area of 88,074 hectares (217,640 acres) as of 2007 which is 0.29% of the Philippines total land area, 3.79% of the regional land area, 6.12% of the island of Samar and 14.56% of the Samar province area. Forty percent of the city's land area are plain and hilly terrains with elevation ranging from 5 to 20 metres (16 to 66 ft) above sea level. The rest are rugged mountain ranges with elevations from 300 to 700 metres (980 to 2,300 ft) above sea level. Flooding is minimized because of many rivers, brooks, streams and natural water conveyors that flow towards the sea. Calbayog experiences a variety of wind types: Amihan (northeastwind), Timog (southwind), Habagat (southwestwind), Canaway (northwest wind), Cabunghan (east wind), Dumagsa (southeast wind) and Salatan (west wind). Calbayog has well distributed rainfall throughout the year, except during the summer months of February through May, when most parts of the city are dry. The highest rainfall intensity recorded is 267 millimetres (10.5 in) per hour. Heavy downpour is seldom experienced in the locality, therefore making Calbayog potentially appropriate for protective agricultural investment. The city's 157 barangays are grouped in three districts. The district is located in the southern and eastern boundaries of the city and is the main political and commercial district of the city. The district is bounded to the north by the Oquendo and Tinambacan districts, to the south by the municipality of Santa Margarita and to the east by Matuguinao. The district comprises 84 barangays and has a population of 103,051 (2015 census) with a land area of about 446.6 square kilometres (172.4 sq mi). The Tinambacan district is located along the northern boundaries of the city, it is bounded to the north by the municipality of San Isidro, to the south by the Calbayog district and to the east by the Oquendo district. The district comprises 27 barangays and has a population of 46,157 (2015 census) with a land area of 182.9 square kilometres (70.6 sq mi). The Oquendo District is located along the northeastern boundaries of the city, it is bounded to the north by Lope De Vega, to the south by the Calbayog district, to the east by Silvino Lobos and to the west by the Tinambacan district. The district comprises 46 barangays and has a population of 34,643 (2015 census) with a land area of 251.2 square kilometres (97.0 sq mi). According to the 2015 census, Calbayog has a population of 183,851 making up 23.6% of the entire population of Samar Province as of August 1, 2015. About 80% of the population speaks the Waray-Waray language, 15% Cebuano, 2% Tagalog, 1% Masbatenyo and 2% other languages. English and Tagalog are widely used in the business and educational sectors. 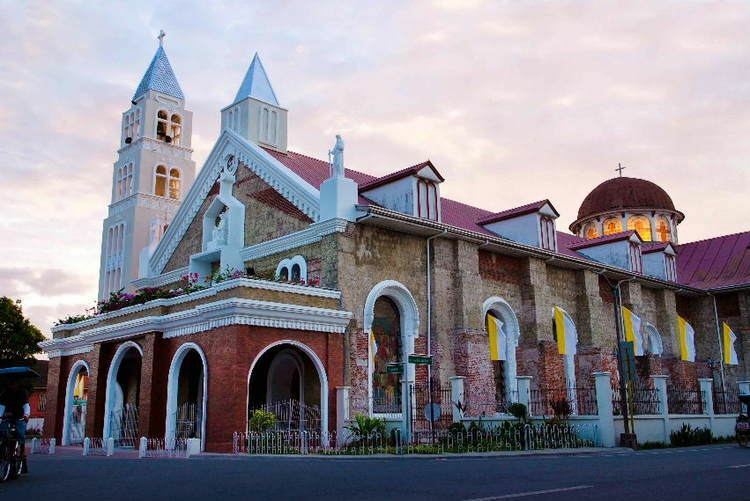 Calbayognons are predominantly Roman Catholic, and the city is thee see of the Roman Catholic Diocese of Calbayog since 1910, when it was split from the diocese of Cebu (now an archdiocese). It also has a notable Muslim presence and small Christian minority groups are also present in the city. Calbayog serves as the commercial, industrial and fishing center of the province of Western Samar, it is currently one of the tigers among the urban centers of Region 8. Its income totaled approximately PHP 77 Million in 2014, making it the third highest-income city in Region 8. Calbayog City is the principal outport (abaca and copra are shipped here) for the province's northern plains. It also serves as a main Coco Oil producer, as international vessels regularly dock at a port owned by Samar Coco at Barangay Malajog. There are fouteen banks operating in the city, including RCBC, PNB, Greenbank, Eastwest Rural Bank, UCPB, CitySavings Bank, Rural Bank of Calbayog City, Landbank, OK Bank, MetroBank and Asia United Bank. The land area of the city is generally divided into agriculture and forestry areas. Agricultural lands are subdivided into production, built-up area, protection land, mangrove, severe erosion area, and watershed forest reserve; while forest lands are further subdivided into open canopy, logged-over areas, built-up and protection areas. Largely an agricultural city, 57,654.07 hectares (or 63.85%) is used for agriculture while 32,645.93 hectares (or 36.15%) are forest lands. Its major products are copra, abaca, rice, vegetables, corn, rootcrops, fruits, bamboo and nipa, with the overall total quantity (mt.) of 28,330.428. Calbayog is an exporter of fish and other marine products. Fisheries contribute to the economic revenues of the city. Major species abound such as mackerels, sardines, squids, prawns, crabs, shells, oysters and others. Fish processing such as smoking, salting and drying are small scale industries operating in the locality. Fresh catch are exported in huge volume on a daily basis throughout the country. Samar Sea, with a fishing ground of 1,198 square miles (3,100 km2), is a vast resource for agriculture and maritime fish farming activities. Aquatic resources like waterfalls or a water rapids are develop in here too, this image is one of the many sources of Potable Drinking Water here in the City, this Dam is used for NAWASA and is currently being develop for a higher electric production by its water turbine electric generator. The more community use water for sanitation, hygienic purposes, watering plants, irrigation the higher is the electrical capacity. The forest land of Calbayog has an area of 6,327.91 hectares. Happy Valley and Seven Hills are remote areas with barangays producing forest products like rattan, nito, cogon, bamboo and others. These are adequate supply of raw materials for export oriented products. Local sources revealed that forest land have dramatically dwindled. The remotest forest areas have been depleted with the traditional slash-and-burn farming, poachers and illegal loggers invading the resource thereby endangering valuable species and wildlife. Some are even entirely wiped out. Intensified programs by concerned agencies are now in motion to save forest resources, including reforestation and tree planting. Production of livestock and poultry products is another industry that enjoys the major concern of the city through the Tri-District program, a centerpiece program of the present government. Breeding centers were opened to develop superior genetic stocks and upgrading of carabao and dispersal program were established to accelerate livestock production. Dressed chickens are now exported throughout the region especially in Masbate, with an average of 2,000 heads daily. The investment of Swift Foods Inc., which has been operating in the city for almost five years, and the operation of Solmar Dressing Plant supply poultry products which is now expanding its market in Central Visayas and Luzon. The waray-waray rice heavy machineries milling and packing processing center. Nature has made Calbayog replete with mineral deposits. Unprocessed or natural marble is found in coastal barangays. Manganese, which is chiefly used in the form of ferromanganese in steel making, is similarly available in the area. It was however purposely left untouched to supposedly preserve the natural balance of the area. Sand and gravel are also supplied to meet local construction needs, though barely enough as some areas are banned from extraction in order to protect existing structures. Constructed in 2013, the Calbayog Land Transport Terminal and Calbayog Public Market is situated within the perimeter. Newly constructed industries and institutions are located here. This is for the preparation of becoming a Regional Center of the Island of Samar. From National to Provincial and then to the City reference Cadastral Monument with coordinates East 12.06663 / North 124.59449 going 2,958.52 meters to East 12.06230 / North 124.61164 center point of CMDA. Constructed in the 1800s, it became the see (central church) of the new Diocese of Calbayog in 1910. Considered to be the biggest church in Samar, the Saints Peter and Paul Cathedral was rebuilt and renovated through the years and evolved to a blending of many architectural eras. The structure reveals some are new and some are old. The old dome, the spire and the thick walls are what is left from the original Spanish-built old church. In general, the Spanish influence in the architecture is but revealing. Materials were from a scree formation or somewhat limestone or white rocks near Malajog. This image was taken from an Antique Painted Frame located at the left side across the street of the Central Church (Sts. Peter and Paul Cathedral). The largest park in the city, it is named after the local hero Benedicto Nijaga. It is located beside the Calbayog River which separates Downtown and Brgy Obrero which leads to the northern parts of the city. The park also has an artificial replica of Bangon-Bugtong Falls. Nijaga is a local hero in Calbayog. The largest park in the city is named after him. A monument of Jose P. Rizal y Mercado y Navarro can be located here. Located across the Sts. Peter and Paul Cathedral and the City Hall. A conspicuous plaza with the image of the Sacred Heart where socio- civic and religious activities are held; its bright lights and relaxing ambiance attracts strollers. Ever since November 2013, the plaza has been renovated and gated to include a fountain, various amenities and a more relaxing atmosphere. The Calbayog City Zip were from a mountain in Malajog Beach down to the nearby island, it is with a jacket like carrier attached to a roller with the steel cable and tourist being towed by a rope from above the highest elevation and then down to the island were you will take a boatride going back to the coastline of Malajog Beach. Malajog Ridge Nature Park were famous among Calbayognon since it is the source of the old church that were made from stones or rocks, the St. Peter and Paul Basilica of Calbayog. 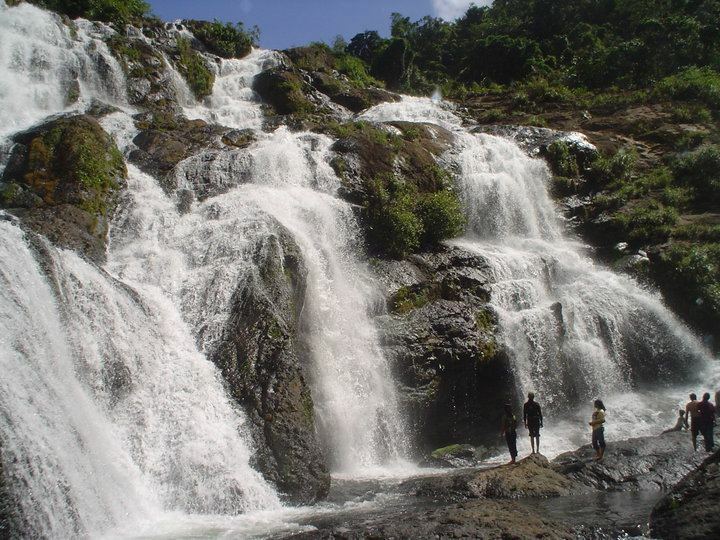 Calbayog is known as the city of water falls. Situated at the fringes of Barangay Longsob, Oquendo District, Calbayog City. Accessible in a 30-minute ride to Cabugawan plus 50-minute hike to Lungsod Cave. Its large entrance leads to a natural tunnel with an uneven ceiling, some portions touching one's head giving him an eerie trip through the dark, cool interior. Located in Barangay Rizal II, Oquendo District, Calbayog City. A 30-minute ride to Oquendo from Calbayog plus 15-minute hike to the spring. "Mapaso" literally means hot. Fresh crustaceans (pokot) abound. They are naturally pinkish resembling scalded shrimps due to the high temperature. Accessible in a 35-minute ride from Oquendo District, Calbayog City proper to Barangay Mawacat plus 25-minute walk along the foot trail lined with tall shady trees. It is a natural spoon-like formation which inclines more or less by about 45 degrees and stretches 50 meters long. Water flows along this giant cistern and from the top one can slide through the mossy lane to the cool inviting pool below. Located in Brgy. San Joaquin of Calbayog City, an hour-and-15-minute ride to Barangay Tinaplacan plus 45-minute walk to the vicinity of the falls. 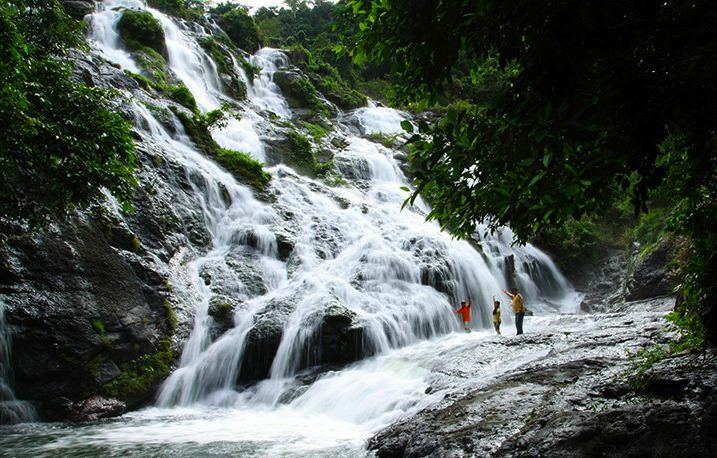 Among the family of waterfalls of Calbayog City, Bangon, Bugtong Falls is one of the most majestic and spectacular spots that is worth visiting. As one ascends the stream, he will be amazed to see a circular pond about 30 meters in diameter, wide enough for swimming and deep enough for diving. The cascading water seems to come from streams flowing endlessly, resulting from the pressure of its disgorge, which becomes even bigger in volume and noticeable as the time of the day passes. Bugtong Falls is not only a tourist spot but also a potential source of power for Calbayog City and its neighboring localities. Located in Barangay Cagbayang, Oquendo District, an hour drive from Calbayog City and 40-minute walk from the villages. A beautiful and scenic waterfall. This wonderful creation of nature is a favorite picnic site of local residents and their source of potable water. Located in Danao, some 14 km toward the western coast of Calbayog City. Made up of seven chambers inhabited by various species of snakes and bats, as evidenced by a good deposit of guano. The cave serves as an initiating place for those who want to acquire a talisman. Located within the Calbayog Pan-as–Hayiban Protected Landscape in Brgy. Pilar, Oquendo District, an hour drive from the Calbayog City proper plus 1-hour walk onwards from the village. More than a beauty spot, this falls is the primary source of water for its residents. At places where the cataract is so high, the water falling into the pool below becomes a mere mist. Located in Brgy. Maguino-o, Tinambacan District, Calbayog City, it is separated from the mainland by the Silangan Channel. A potential deep diving spot, about 40 to 50 meters from the water surface and measuring less than a hectare in area. The islet is surrounded with aquifers equally and uniformly spread at the peripheral limits of the islet with white sand and pebbles. Beneath the deep waters are sea corals of multifarious varieties, rare white pebbles spread all over the floors, 20 types of shells, and ornamental types of aquamarine species – which can all be explored by the diver for as long as in his underwater gear. Located in Barangay Lungsod, Oquendo District, Calbayog City. "Tinago-an" means hiding place. Its natural dark tunnels offers excitement and thrill to adventurers. A 40-minute drive from Calbayog City. Grayish sand, blue waters, swaying palm trees, towering rocks, and three balconied cottages give this spot a South Sea island appeal. Magnificent view of sunset behind nearby islands. Made famous by the visits of VIPs, movie stars, and diplomats. A 45-minute ride to Barangay San Joaquin, Tinambacan District from Calbayog City proper and a 25-minute hike onward to the falls. It is separated from the mainland by the Silangan Channel. A series of towering altars of rugged stones where between its depressions flow ribbon-like cool water that appears to cleanse the hair of a legendary lady. A source of potable water for local folks. A 45-minute drive from Calbayog City proper to Sigo plus 30-minute hike to Ton-ok falls. A scenic waterfall hidden in lush tropical vegetation. Nature has placed it out of easy reach to preserve its beauty. A source of hydroelectric power. A ten-minute drive from Calbayog City proper. Cottages line along its grayish sandy shore. Its cool fresh water, scenic view of Samar Island attracts picnickers and beachcombers. A 20-minute walk or 7-minute drive from Calbayog City proper. It is located along the Maharlika Highway. An uncrowded pearl white strip of coastline with coconut trees offering a scenic view of islands and towns. Located at Calbayog City, near Malajog beach. Sarakiki is a local term apparently referring to premeditated or frenzied movements which means to allure, to draw with, to attract or exercise attraction, to entice or to win. By its pre-colonial denotation, it means to praise, extol or eulogize spirits of gods. The word does not only ascribe to the ritual or hadang as an activity to gratify the gods, but likewise hadang as the offering or the sacrifice. Sarakiki as a ritual dance per se is a dance-offering of the Warays to their deity or deities which traces its roots to pre-colonial religious beliefs. Calbayognons held that spirits occupied a position of command over the power of nature which may inflict harm or do good in society. Rituals to please these spirits were held during feasts and other occasions like planting and harvest season, drought and in times of dreadful epidemics. The ceremony could last a couple of days. It involved the entire villagers who offered (manok) sacrifices to venerate the spirits. Traditionally, our forefathers make use of patani ug ugis nga manok (black feather and white feather chicken) as the offering in veneration of the spirits. In the context of cultural development, the term Sarakiki is adapted to describe the significance of the movements used in the famous dance "kuratsa", a courtship dance eminent to all Calbayognons. Today "kuratsa" is the most popular dance form consummated in all celebrations most especially during wedding jovialities. Sarakiki is likewise place forth in songs particularly the SADA-SADA an event of merriment in the evening before a wedding ceremony, which redound to one of our most well-liked tradition, the so-called pamalaye or pamamanhikan. Another confirmation is the thumbs-up form of the Calbayognons while dancing which represents the tahud. 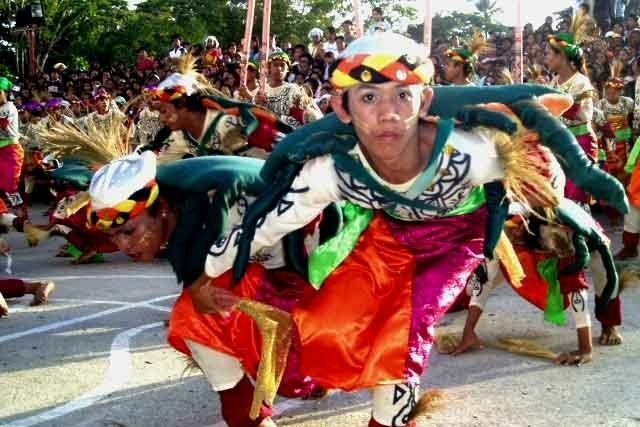 During the 1st Grand National Streetdance Competition – Aliwan Fiesta on May 1–3, 2003, participated by 26 famous festivals in the country,the Sarakiki-Hadang Festival of Calbayog City won the 3rd prize. Sarakiki-Hadang Festival is celebrated in Calbayog City every year from September 1 to 8 under the auspices of the City Arts And Culture Office. Guin sasalin-urog san bulan san oktobre dyes (10) kutob oktubre desisais (16), ini nga selibrasyon nag papamatood san anibersaryo san syudad san calbayog. Pinaagi sine durudilain nga mga aktibidadis an guin papasidungug san syudad pinaagi san mga opisyalis ngan iba pa nga mga pribadu nga sikto. Subay sine an parada nga guin ungayan san mga durudilain nga mga iskwelahan, pagkakamay ada san kadatuig nga guipiliay san kahusay nga may ada tema nga Indian. Kompetisyun san mga festivals san syudad.Guin papahinumdum ine san ngatanan para sa aton. This is a less popular but a more traditional celebration of the folks from Brgy. Matobato about merry dancing at the shores bearing the image of Nuestra Senora de Porta Vaga, more popularly known as "Soleda". This festival is specially pursued and initiated by the descendants of the early settlers in the community called "Tagalugan" referring to Tagalog speaking migrants from Cavite City during the Spanish era. The celebration is prominently highlighted by the presence of "kubol" or sea-shanties made up of bamboo and coconut palm leaves. The devotees dance their way from the local Chapel as they bring out the image and pass by the different "kubols" until reaching the main "kubol" where a simple ceremony is conducted. The date of celebration though is not very prominent because of the confusion of the actual festival day which falls every second Sunday of November. "Calbayog Ko" is a famous folk song in the city composed by Jose Cinco Gomez. It serves as a symbol of the love of Calbayognons to their city and it serves as the "anthem" of the city. It is even sung before the office in the city hall start their duties. Rope : Stands for the abaca industry in the city. Cross and Bishop's Cane : Represents the Diocese of Calbayog. Shells and Fishes : Stands for the shell and fishing industry in the city. 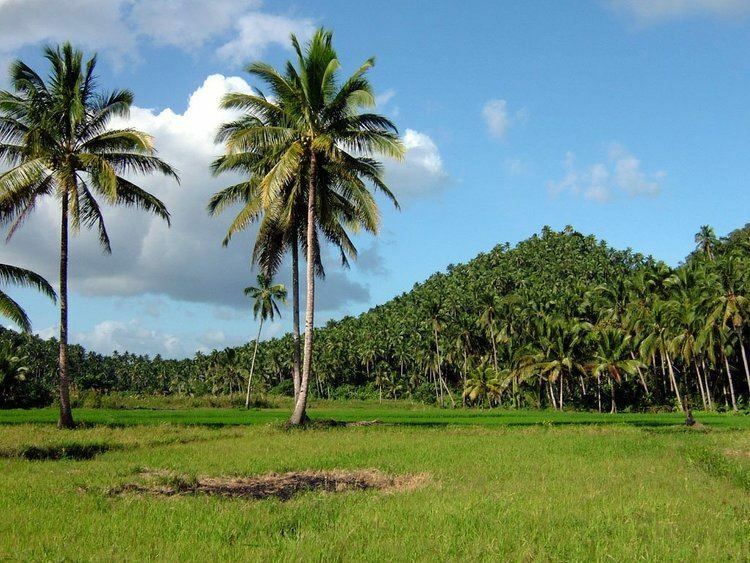 Coconut Tree and Rice Fields : Symbolizes the major products of Calbayog. Buses ply Manila-Calbayog and Davao-Calbayog routes daily for approximately 18 hours. Buses daily take passengers to as far as Manila in Luzon and to General Santos in Mindanao. Provincial buses and jeepneys as well as vans take travelers to almost all the key towns in the Eastern Visayas regions. Tacloban, which is 183 kilometers away, by regular transport vans and buses in about 3 hours. The common mode of transportation within the city limits are buses, jeepneys, motorized cabs and tricycles. Cebu PAcific Air flies to Cebu from Calbyog. Calbayog Airport is the airport serving the general area of Western Samar. Currently,the PAL Express operates daily flights from Calbayog-Manila and Manila-Calbayog and Cebu Pacific with 5 flights Cebu-Calbayog and Calbayog-Cebu in a week The airport is a secondary choice for those from Eastern Visayas who want to travel by air to Manila and Cebu. The terminal building is currently under renovation. The extension of the runway to 1900 meters has started in 2013 including other facilities and amenities.It is a 1.3 billion project of CAAP under the DOTC. Calbayog City Maguinoo Port, situated at Brgy. Manguinoo, Tinambacan District, is used by passenger boats plying the Calbayog-Cebu-Calbayog route and chartered cargo ships to transport copra and abaca hemp to other points of the country uses the Calbayog City Main Port. Bigger cargo ships and inter-island vessels as well and considered to be an alternative seaport in the locality is the Calbayog City Port Proper. Motorized boats also ply to Masbate Island and the neighboring island towns of Tagapul-an, Santo Niño and Almagro uses the Calbayog City Port. The Calbayog City Water District (CCWD) by virtue of Sanguniang Panglungsod of the City of Calbayog Resolution No. 169 dated July 22, 1986 is in charge of the water utility in Calbayog City. As of 2017, it is using the Himonini River and Pasungon Falls as water sources. The Dawu interior of Danaw, water reservoir, a dam were built for the Calbayog City Water District near Malajog. The dam were built for irrigation on nearby villages of Pilar and Dawu. The old dam or reservoir that was built near Oquendo is somewhat hefty and expensive since it uses river water and being expensively financed for purifying the river water. The new reservoir was connected to the old pipelines of CCWD. Some Fire truck Hydrants were located inside the City. Samar I Electric Cooperative, Inc. (SAMELCO I) is located on Cabayog, it has three sub-station powered by the Tongonan Geothermal Energy, transmissioned by National Grid Corporation of the Philippines (NGCP) to its main office in Carayman. Then distributed the 3600 volts step-downed power from Tongonan to its Two Substation. The sub-station can be located in Erenas, San Jorge, Samar and Lonoy, Oquendo, Calbayog Samar. Both has the capacity of 5 Megawatts or 5 thousand kilowatts while Area 1 in Capoocan, Calbayog City is 15 MWatts. The Lonoy sub-station is the second area to be served and called as Area 2 and in Erenas were Area 3. Lieutenant Benedicto Nijaga (1864–11 January 1897) - nicknamed Biktoy, one of the "Thirteen Martyrs of Bagumbayan", executed in January 11, 1897 in Bagumbayan (Luneta Park).